Here is my card for this weeks Mojo Monday sketch from Julee at Poetic Artistry. I decided to ink up my Elzybells Igloo stamp for this one. The image is stamped in palette noir black and then colored with my copic markers. I added a little bit of frosted lace stickles for some sparkle. Then I punched the image out with my pink scalloped oval punch from Marvy. Instead of matting the image on to more ovals I used my colluzle oval template and cut out the oval frame using some green Basic Grey paper. The other papers are from the K-ology Addison collection from K&Company. I wanted to add brads to the little tabs but didn't have any red brads so I colored white ones with my lipstick red copic marker. This was a fun sketch to work with. Switching gears now, let's talk weather. I live in Duluth, MN which is located on the southwestern tip of Lake Superior and the current temperature is -4 degrees. A little cold for November (even in Duluth) but that still isn't keeping people inside. 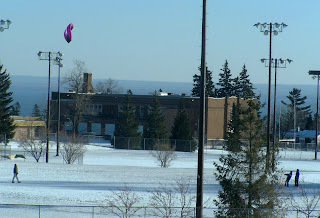 Here' s a photo I took out my office window earlier today of some people flying a kite. May you all have a kite flying kind of day. While out getting my daily blog dose this morning I discovered that Anna Wight and Lyndsey Botkin have posted another showdown challenge on their blogs. And . 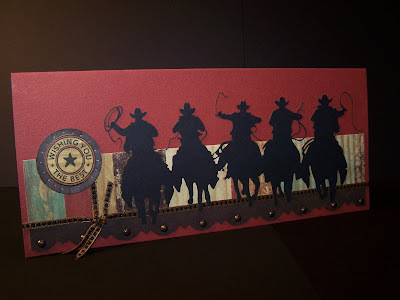 . . they used the Cowboy laser cutout that I sent them. 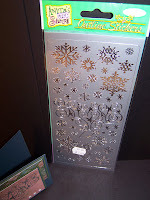 When I found the laser cuts at Deluxe Designs I immediately thought of them so I had to buy several and share them. Here's the card I posted on Splitcoaststampers a couple of weeks ago using one of the cowboy cuts. 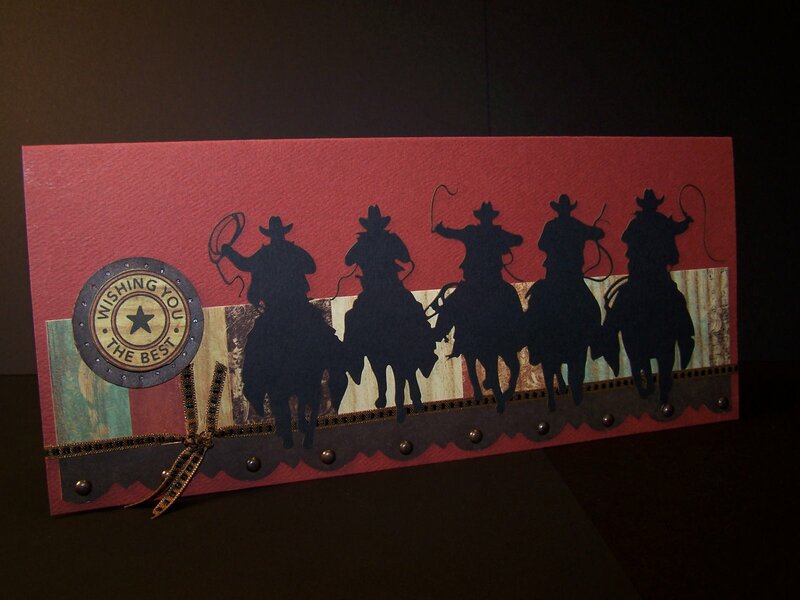 To accommodate the size of the cowboy round-up die cut I made this card 9 1/4 x 4 to fit a regular business envelope. The scalloped edge is from the Wanted pack of paper by Cosmo Cricket. I inked the edges and added some brads to the scalloped piece. "Wishing you the best" is mounted on pop dots and the brown outer circle is paper pierced. Deluxe Designs is having a 50% off sale this week (through December 3) if you're interested.
. . . sounds like a good reason to stamp! Although any reason to stamp is a good reason. So, here is my card for the weekly sketch challenge on SCS's. The stamps are from the Chai Latte set by Inque Boutique. I plan to add words to the labels on the cups once I decide who to send this to. Maybe I'll put "many" on one and "thanks" on the other. I stamped the words across the top and the cups using Brown Timber staz-on and then stamped the swirls using Stampin Up Close to Cocoa. The cups were colored with my copics. The front two cups were stamped on a scrap, cut out and mounted with pop dots. All of the white panel edges were sponged with Close to Cocoa and then I pierced the bottom edge of the large panel and added brads across the top. The white panels are mounted on SU Chocolate Chip and then layered onto SU Old Olive. I'm really enjoying this whole blogging thing. I see from my counter that a few people have found it so it's nice to think I'm not talking to myself. Feel free to leave me a comment or two so I know who you are. And as always, thanks for stopping. I generally don't use stickers on my cards but when I saw the Outline Stickers from Anita's Art Stamps I had to give them a try. They are available in silver and gold and look like an embossed outline image when removed from the sheet. I found mine at Barbara's Rubber Room. She has a store in GreenBay, WI but also takes online orders via email. I placed my order through email and it arrived yesterday so I pulled out the reindeer first and made a card. No stamping on this one, just a little sponging with blue bayou around the basic grey snowflake strip of paper. All of the patterned papers and the pink are from Basic Grey and the blue and green are from my LSS. I added the bazzill brads to help balance the card. Thanks so much for stopping. I pulled another Santa out of my stack of colored images and put together this card. The layout for this card was inspired by the birthday card that Julia S sent me last year. 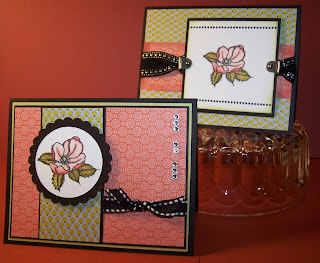 Her card can be found in my stamp room and her Splitcoaststampers gallery. I encourage you to check out her blog and her SCS gallery if you're not familiar with her work. She is an amazing designer. For my card I went with the traditional size card instead of the square layout but knew I wanted to keep the ribbon and eyelet element and the word circle with the sticker center. I found some wonderful bubble stickers at the $1 store and had to use one on this card. The paper piercing is done by sewing a zigzag stitch without any thread. I ran my white souffle pen over the piercing for a faux stitched look. 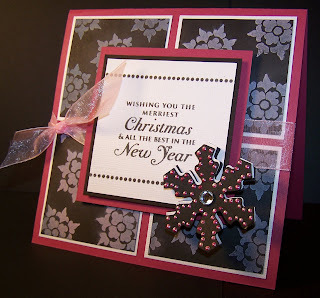 The patterned paper is from Basic Grey's Dasher collection and the pink is Regal Rose from Stampin' Up. I ran the pink circle under the sentiment through my Cuttlebug using the snowflake embossing folder and inked the edges with some white craft ink. Thanks for stopping. Today's card was inspired by one of my Christmas ornaments. I started decorating for Christmas and when I pulled the metal poinsettia ornament out of a box I had to try recreating it with paper. I pulled out my Die Cuts With a View Earth Tone Mat Stack and punched five red ovals using my large Fiskars oval punch and then punched 3 green ovals using the smaller Fiskars oval punch. 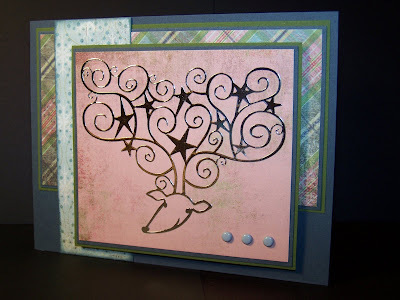 I ran them all through my Cuttlebug using the Textile embossing folder. Then I folded the red ovals in half and trimmed the ends of each petal to a point. The center of the flower is a punch from Punch Bunch. I punched out three of them from craft paper and added clear gemstones to the centers. I didn't like the gemstones clear so I used my yellow ochre copic marker on them to give them a yellow glow. For some contrast I mounted the flower on a black panel that was also run through the cuttlebug and added black layering to the other elements to pull it all together. I'm pretty happy with the way it turned out. Thanks for stopping. Recently I joined the Hambo group in Taylor's ATC swap but since I didn't own any Hambo stamps I had to place an order. They have so many cute stamps it was really hard to not get too crazy with my order. 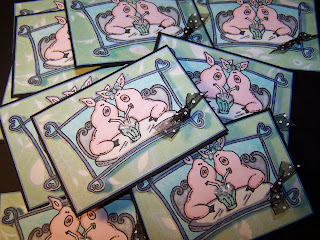 I fell in love with the soda fountain piggies and used them for my ATC. I stamped the piggies on gorgia pacific white cardstock using palette noir black ink and then colored them using my copic markers. I added scribbles 3D iridescent white mist paint to the soda and crystal stickles to Miss Piggy's bow. Then I cut the image out and mounted it on printed paper from one of my provo craft superslabs. For the blue layer I used white cardstock and inked it with the same blue copic that I used to color the heart outline on the piggies then matted the whole thing onto black. To finish it I added some polka dot ribbon. 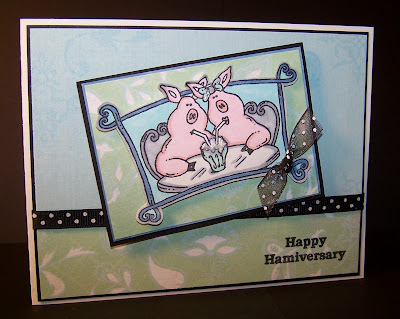 I made one extra ATC to use on a card since I also ordered the "Happy Hamiversary" sentiment to go with the piggies and wanted to use it. This was my first time making ATC's and I was surprised at how much fun they are to make. I'll be watching for more swaps to join. Thanks for stopping. After a good cleaning, some oil and a new needle I got my sewing machine to work. So I decided to make a card with some zigzag stitching. When my Believe set from Papertrey Ink first arrived I stamped several santas with palette black noir ink on craft paper and sat one evening and colored them. They have been sitting in a stack ever since so I pulled one out and stitched it onto some bazzill green from my LSS. I stamped the sentiment from the Papertrey Faux ribbon set in colorbox chalk warm red and layered it but the punched out circles seemed to big for the sentiment so I decided to try adding some stitches to that piece too. Then I colored a petite prima with my copic marker to match and added a gemstone to finish it. For the ribbon, I used the slot punch on the santa panel so I could feed the ribbon through and tie it into a bow. I had a card that I made in February of 2006 with this kind of fold and thought I would try it again. The base is 6 3/4 x 10 3/8 folded in half the long way. Then scored at 3 5/16 and 4 7/8 from the same end. Between the two scores you will score at a diagonal starting at the center of the 4 7/8 score line. For folding the 3 5/16 and 4 7/8 scores will be valleys and the diagonal scores will be peaks. For the diamond image panel I stamped the PSX santa hat with palette noir black on shimmery cream cardstock. The hat was colored with a lipstick red copic ma rker and then covered in frosted lace stickles. 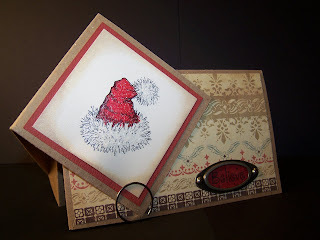 The edges were sponged with Tim Holtz antique linen and SU basic brown and then the piece was layered onto red from my LSS. The designer paper is some of the Cosmo Cricket paper I had out from yesterday. I stamped the Studio G Believe stamp on craft paper and colored that with the copic marker too and punched it out using the large oval punch from Fiskars. Note: The large Fiskars oval punch fits the SU Hodgepodge Hardware frames perfectly. I mounted the SU HH frame over the believe oval to finish the card. The circle clip on the bottom of the card is to hold the front of the card down for picture taking purposes. This week's Ways to Use it challenge on SCS was to add stitches to your card I figured it was time to try sewing on my card. My Singer sewing machine is in need of repair so I broke out my little Provo Craft Sew Crafty Mini. The nice thing about the Sew Crafty is that it's tiny and doesn't weigh anything, unlike my old Singer. 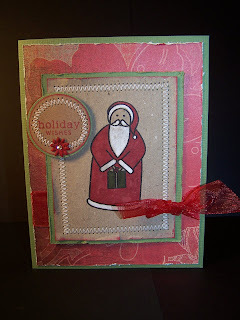 I started with a red base (5 1/2 x 4 1/4) and added a 4x4 square of Gretel paper from Cosmo Cricket. The main image is on SU very vanilla. 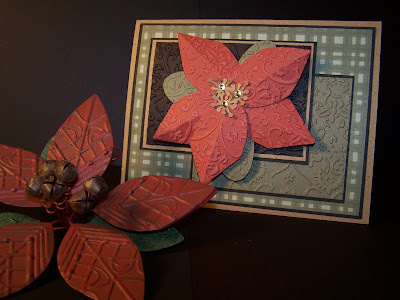 I stamped the greeting using the Holiday Wishes set from Papertrey in Stazon Timber brown. The PSX pine branch was stamped in SU True Thyme and the red circles were stamped off once using SU cranberry crisp. I inked the edges with Tim Holtz Antique Linen Distress ink. Sewed around the edge, then layered it on a square of the reverse side of the Gretel paper and a layer of SU chocolate chip. Added a prima flower to the corner with a fancy brad for the center and now it qualifies for last week's "Unique Brads" challenge too. 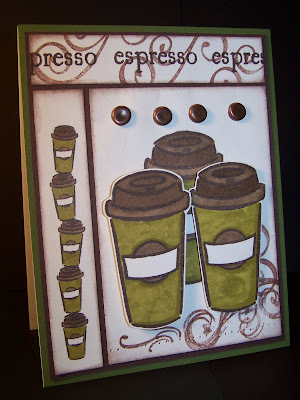 I made this card for Julee's Mojo Monday challenge. I started with a 5 1/4 in base of purely pomegranate and then cut 4 squares of pink and 4 squares of black. The pink squares are 2 3/8 and the black squares are 2 1/4. I stamped signature flowers from fontwerks in white craft ink on the black squares and added pink chalk with a cottonball to the flowers (don't you think they look like snowflakes). The center pink square is 2 3/4 inches and stamped with the line of dots from paper trey's faux ribbon set and a sentiment from papertrey's holiday wishes set. I used palette noir black ink to stamp them. The snowflakes are a marvy uchida punch. I punched two from black and one from the light pink and stacked them together using popdots for some dimension. The center has a rhinestone brad from Creative Keepsakes and the edges are dotted with scribbles 3D paint in iridescent plum luster. I added some ribbon around the center to finish it off. One year ago today my husband, daughter (17), myself and Toby (our dog) piled into the van for a road trip to an animal shelter 3 1/2 hours away. 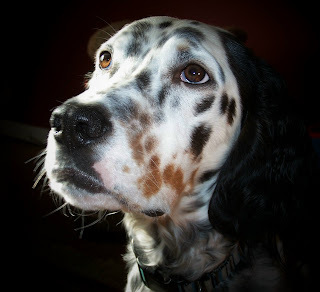 We had a date to meet Jacks the six month old English Setter. It all started with a search on petfinder.com which led to a date to meet him. The meeting went well and Jack is now part of our family. 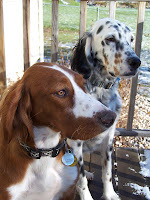 Meet Jack (tri-color english setter) who was adopted from Crossroads Animal Shelter in Buffalo, MN and Toby (mix) who was adopted from the Friends of Animals Humane Society in Cloquet, MN. Aren't they just the cutest!?! In honor of Thanksgiving I made a turkey card. 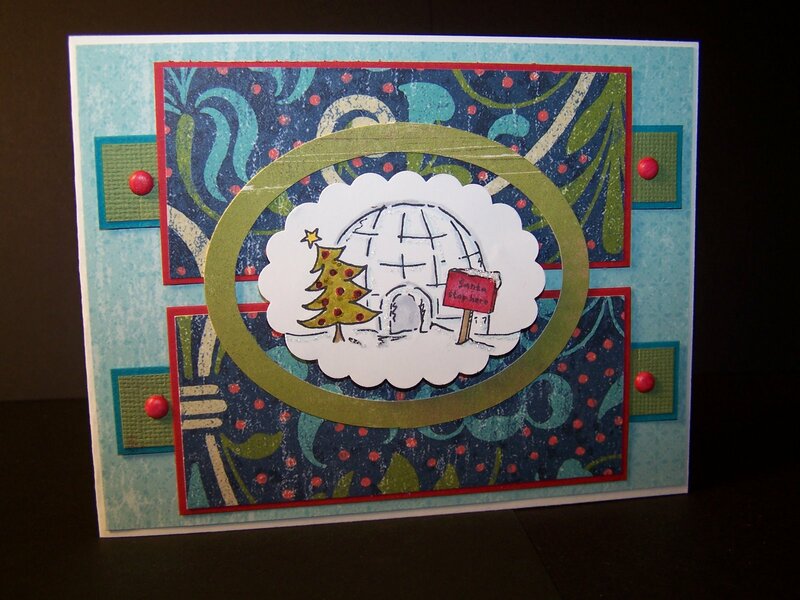 The template for this card is from Susan Stringfellow of the Inque Boutique's design team. For my card I started with a marigold morning base (5 1/2 x 4 1/4) and then added a layer of kraft paper. I sponged the edges of the craft paper with close to cocoa and chocolate chip and then used my sewing machine to pierce the edges. Quick Tip: A fast way to paper pierce is by using your sewing machine without threading the needle. I stamped Lizzie Anne Jolies Fleurs with Tim Holtz Antique Linen Distress ink on the craft layer but once it dryed it's no longer visible. Oh well. Next time I'll have to use a darker ink. 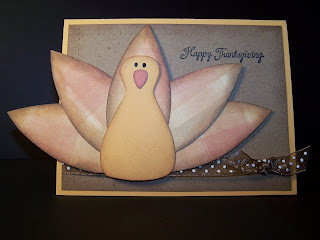 The Happy Thanksgiving is from Double D rubber stamps and stamped in Palette Noir Black ink. I added the swiss dot ribbon to the bottom for some balance and then cut out the turkey using the template (link above). His feathers are Frances Meyer Indio Plaid, body is Stampin up Marigold Morning and beak is We R Memory Keepers. All of the edges were sponged with close to cocoa and chocolate chip. The eyes were drawn on with a copic multiliner. The bottom of the body was also stamped with Lizzie Anne fleurs. The turkey is mounted on pop dots for a little dimension. While reading the latest A Muse News I found a cute calendar for 2008. For a $3.00 donation I was able to download the calendar. All donation proceeds go directly to the Scleroderma Research Foundation. I thought these would make really cute gifts for the members of my book club and then I saw Linda's idea to use the calendar on a card so I had to create a calendar page for December 2007 for our December book club meeting which I am hosting. I will be using these for the invitations. 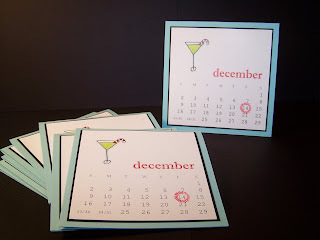 I created the December 2007 calendar and printed them up on white cardstock. 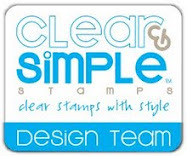 They measure 3 3/4 inches square and are layered on 3 7/8 squares of basic black from Stampin Up. 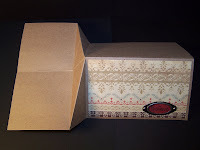 The card base is 4 1/4 square and made from cool caribbean (retired color) also from Stampin Up. The holiday drink is a $1 stamp from Studio G. I masked off the words on the stamp and stamped the drink using Palette Noir Black ink. The image was colored using my copic markers. I was going to just use my red copic marker to circle the date but decided a stamp would be more uniform so I went through my stamps and decided on this one from the Clearly Wordsworth Vacation set. I inked it with Warm Red Chalk ink. Inside I will print all the details of our get together. Thanks for stopping. Supplies: White cardstock, December 2007 calendar; Color printer; Studio G drink stamp; Clearly Wordsworth Vacation set circle stamp; Palette Noir Black ink; Copic makers; Colorbox Chalk Ink warm red; Stampin Up basic black, cool caribbean. Here is a close up of one of yesterday's cards. I stamped the flower with noir black palette ink on whisper white cardstock and colored it using my copic markers. The edge of the panel is sponged with Tim Holtz peeled paint distress ink. The patterned papers are from the Reef Journey pack by 7 gypsies. 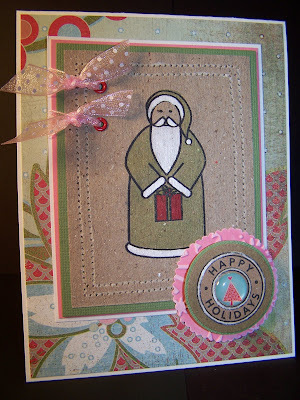 I broke out my pewter Hodgepodge Hardware from Stampin Up to mount the ribbon around the card. I love the hardware but find it hard to actually use it. I'm not sure what I'm saving it for. The ribbon is some that I picked up from WalMart. 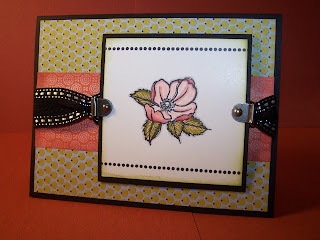 The black rows of dots to the main image panel use the Faux Ribbon set from Papertrey Ink. I love the versatility of that set. Thanks for stopping. Ever feel like you're talking to yourself? Ok, now that I've decided to try blogging I'm wondering how to get the word out so people will stop. I guess we'll just have to wait and see how it goes. In case anyone has found it yet, I will keep posting. I found this unmounted (and unfortunately un-marked) flower stamp in a draw the other day and decided to ink it up. I know it was sent to me as a freebie with an order and I believe it's from Victorine Originals. On the card in the front I mounted the main image on a scalloped circle and paper pierced the edges. For a little more balance on the card I added the crystals to the top right corner. Check out the Blog Candy available from Ericka Hall. Ericka designs for A Muse and has a fabulous blog! Well, I think it's time to join the blogging world. I'm not sure if I'll be able to update it daily but I will give it a go. Happy Tuesday! It's overcast and dreary here in Northern Minnesota today. Lake Superior doesn't look very inviting. They're forecasting snow for this evening so maybe we'll have a white Thanksgiving. Ok, on to the card. I made this card for a design team call but then I never submitted it. 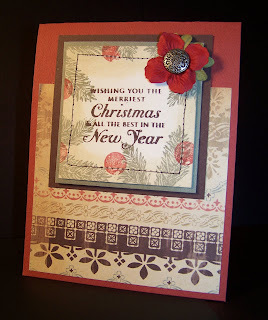 The card is 5 1/2 inches square to accommodate the large chipboard star. 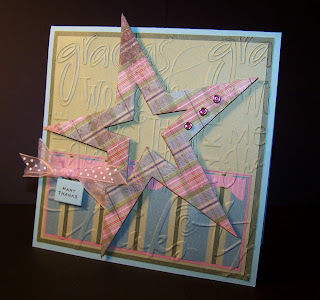 The chipboard star is from ScenicRoute and covered in BasicGrey Phresh & Phunky Phashion paper. I used my cropodile to punch holes for the Making Memories crystal brads. I felt that the background was too plain so I ran it through my Cuttlebug with the Thanks A2 Embossing Folder. I really like the added effect of the embossed background. The other papers are from a mat pack from WalMart and the base is Cool Caribbean (retired color) from Stampin' Up. Thanks for stopping by my blog.